We heard about Joyce Butler from a friend and after meeting her, didn’t think twice. Her experience, confidence and no-nonsense nature was exactly what we felt we needed to assist us in bringing our babies into the world. It’s amazing what the right chemistry between people can do! 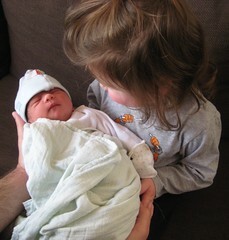 Specifically, I was really pleased with Joyce’s prenatal care, attention to detail, and good rapport with my husband. The most important thing for both of us was that we could trust her to know what to do in any situation. My birth story from my home birth experience with Joyce is here. I have used Joyce as my midwife for both of my children and I don’t think I could have made a better decision. Though I intended to home birth both of my children, I started labor prematurely with my second and so decided to deliver in the hospital (Hadassah Ein Kerem) with Joyce as my birthing assistant. Having experienced both birthing at home and in the hospital I can now highly recommend Joyce in both situations. Read my birth story, posted here. I gave birth with Joyce five times between 2000-2010. I have only good things to say about Joyce and the amazing work she does, and highly recommend that anyone looking to give birth consult with Joyce while considering their options. One of my birth stories is posted here.